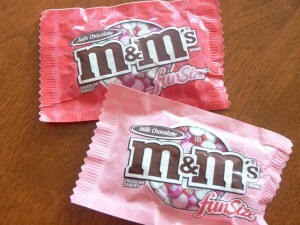 Here is another opportunity to build math skills while having a bit of yummy fun with the small package of Valentine themed M&M’s. This is such an easy activity to set up (click here to see a detailed post from Winter Graphing which shows step by step how to set up the paper). 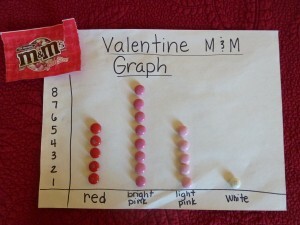 I begin by taking a sheet of paper and write the title, Valentine M&M Graph in this case. I underline it and then make my x-axis and y-axis along the bottom and side. I write the numbers (about the same size as an M&M so they line up) and color words along the side and bottom. Now all we have to do is open the package and complete the graph! I can use the same questions from the M&M sorting activity with this. I like to print them on index cards so I can reuse them or I type them on the computer, print them and cut them out into question cards. I place them question facing down to make it a bit more fun. I’ve found that he gets really excited about flipping them over to see what they are going to ask, like it’s a big mystery. He is definitely more focused on what the question is asking than if I just verbally asked him. It may seem like a minor thing or an unnecessary step but it has made a huge difference for us because he is actually showing me what he knows instead of squirming away to avoid answering questions “mom” is asking. The power of the written (or printed) word! Once our graph is done, we take turns flipping over the question cards and answering them. Do any colors have the same?